When I asked Spitalfields Life contributing photographer Jeremy Freedman to photograph Keith in Sclater St, he came back with a picture of someone I did not recognise as Keith. “This is Keith,” he said. And when he returned next Sunday to seek the particular Keith I had in mind, he came back again from Sclater St with a picture of another man called Keith that I did not recognise. Happily, on the third week, he found the Keith I was seeking and, as a consequence, it is now my great pleasure to introduce you to each of the three Keiths of Sclater St Market. Even as we spoke, a tall white block of flats was being constructed across the road, while lively business went on as usual below among the stalls upon the two remaining pieces of undeveloped land, and Keith winced to peer up into the sunlight at this visible symbol of the changes that threaten his beloved market. “My dad brought me here when I was three or four years old. It used to be a lovely atmosphere,” he mused, contemplating the half-dozen trestle tables that comprise his pitch in this corner of the yard, piled with books, records, clothes, china ornaments and attended by a eclectic display of pictures hung upon the brick wall. In the Winter months, Keith sometimes has a fire in a brazier in his corner and I always come over to examine his ever-changing stock as I work my way through this market each week. Blessed with a placid nature, Keith maintains a dignified presence in his black peaked cap, and his corner is a recognised meeting place where other traders and friends gather in conversation. 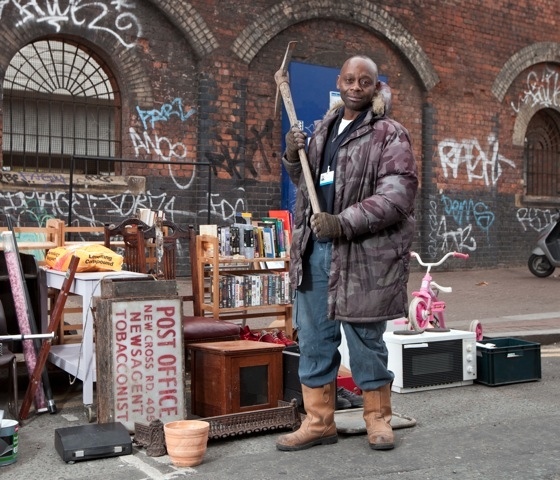 As long as the recession continues, and the development of Sclater St Market remains suspended, you will find Keith presiding here, with the generous civility and modest charisma of one who has emotional if not legal ownership of his territory. 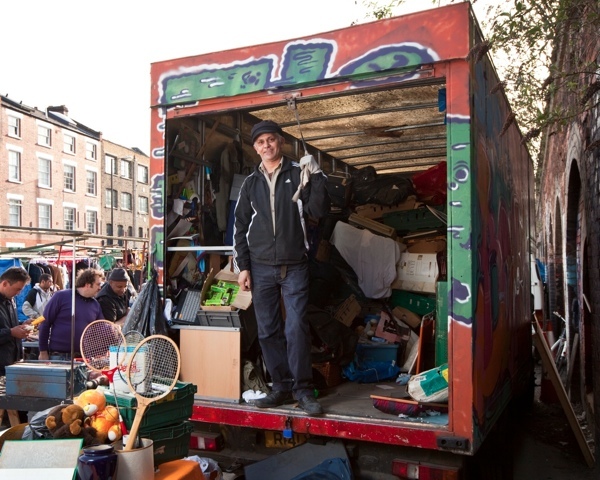 Keith has been here at the Western end of Sclater St for just six weeks and is doing a roaring trade in old clothes, shoes, used computer parts and other junk. In spite of the empty street in this photograph, he could barely stand still for the constant assault of eager customers, swarming all over his gear and making demands from all directions, as we attempted a conversation. “They think you get it for free,” he exclaimed, rolling his eyes in humorous exasperation as an over-zealous bargain hunter attempted to press a pound coin into his hand as payment for an item priced at five pounds. “Do I look like I need a pound?” declared Keith in self-parodic affront, placing his hands up in surrender, while shaking his head in disbelief and breaking into a smile at the audacity of it. 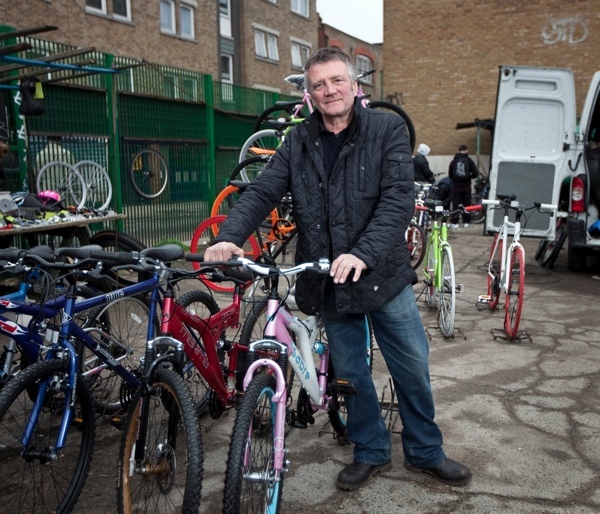 Keith told me he has been selling bicycles in this corner of the Sclater St yard “forever,” which means every Sunday for the last thirty years. Great photos Jez! Love the one of Keith.